The stated purpose of this visit was for the President to stress the importance of the U.S. Supreme Court and of the U.S. Senate proceeding with its normal processes for evaluating a presidential nominee to join the Court and thus to provide a hearing and a vote on the President’s nomination of Chief Judge Merrick Garland to the Supreme Court. The President did just that. After pointing out the importance of the federal judiciary in general and the Supreme Court in particular in our system of government, the President stressed that Merrick Garland was an “eminently qualified jurist,” a characteristic not disputed by anyone in either major political party. Obama added that in selecting nominees to the federal courts, he wanted to find out about their personal lives as windows to their character. For Judge Garland, Obama was impressed by the nominee’s impromptu defense of a classmate’s right to free speech in speaking against the Vietnam War and Garland’s careful investigation of the Oklahoma City’s bombing tragedy and his empathy for the victims and their families. Mr. Obama warned that Republicans’ stance on this nomination could have lasting effects. If he were succeeded by a Republican, Obama said, Democrats would be unlikely to give a new nominee an easy path to confirmation, potentially leaving the seat unfilled for an extended period. Watching the President’s informal session at the Law School, I again was impressed by his intelligence, eloquence and very personable and disarming manner. Later I lamented that this intelligence, eloquence and engaging manner were lacking in so many of the current candidates for the presidency. The U.S. economy has added jobs for 72 months straight. Unemployment is down to 5 percent. The U.S. is not in a recession and a massive recession does not loom. The auto industry just had its best year ever. Most Americans like their jobs and get satisfaction from them. Wages are too slowly rising — but they are going up. The average gap in economic satisfaction between the upper and lower thirds in income is lower than it was during the Reagan, George H.W. Bush, Clinton or George W. Bush years, according to the respected Index of Consumer Satisfaction. Nothing has dimmed Americans’ desire to innovate and make technology work for them. According to the Kaiser Family Foundation, employers are even more determined to provide health benefits than before the Affordable Care Act took effect. The percentage of adults under 65 with employer-based insurance held firm for the last five years after steadily declining since 1999. More than 16 million previously uninsured people now have health insurance. 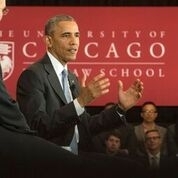 White House, President Obama Participates in a Conversation about the Supreme Court and Our Country’s Judicial System (April 7, 2016) (video of the conversation); Shear, Obama Revisits Law School to Give a Supreme Court Lecture, N.Y. Times (April 8, 2016); Ellperin & DeBonis, To press his Supreme Court nominee’s case, Obama returns to his academic roots, Wash. Post (April 7, 2016); Tau, Obama Says Garland Fight Putting Federal Court System’s Legitimacy at Risk, W.S.J. (April 7, 2016); Gillespie, Obama Returns to the Law School, University of Chicago Law School (April 7, 2016). Unfortunately the Supreme Court has become extremely politicized and no longer strictly adheres to the Constitution of the United States but instead has taken to making decisions based on personal beliefs and society of today. Mr. Krohnke’s Great x5 Grandfather Purly Brown and my Great x5 Grandfather Capt. Benjamin Brown, brothers, fought in the Revolutionary war as a result of the same type of things President Obama is doing, ruling by edict, or executive action if you will. On July 4, 1776 we became a Nation unto ourselves and no longer wanted a King, instead opting for a Republic governed by the people thru representatives elected by the governed. Mr. Obama, and the Supreme Court should work within the framework set by the Constitution as per their oath to uphold it. Glad to know of the family connection in the American Revolutionary War. Disagree on the analysis of the current situation. The amazing record of President Obama was also the subject of a recent column by Fareed Zakaria, who has concluded that Barack Obama has been a transformational president. Zakaria points to the following accomplishments. Second, Obama led the effort to enact a law (the Affordable Care Act) resulting in 90% of Americans having health insurance. Fourth, Obama’s foreign policy has limited “U.S. involvement in establishing political order in the Middle East, focusing instead on counterterrorism,” adopted new approaches to Cuba and Iran and directed attention to the Asia-Pacific region. Sixth, Obama “has let his opponents self-destruct,” resulting in the near or impending destruction of the Republican Party, the American conservative movement and the public-policy legacy of Ronald Reagan in the words of conservative columnist Daniel Henninger.